Louise Swenson | White Wine | Northeastern Vine Supply, Inc. Consistently hardy to -40F. Moderate vigor with an orderly growth habit. Rarely requires shoot pruning. 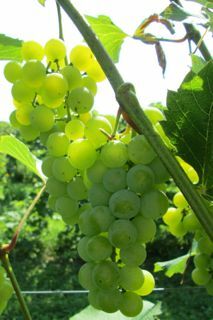 Regular yields of medium sized clusters, 3-4 tons per acre. On the later side to bud out in the spring and very good disease resistance. Performs best on heavier soils or with plenty of irrigation. Wine can be outstanding with aromas of flowers, honey and tangerine. Low acidity makes this a perfect selection for dry white wine. Sugar production is also low, 18-20 brix. Can become slightly labrusca if left to overripe. Somewhat light in body, Louise benefits from a small addition of Prairie Star or Frontenac blanc. Plantings have grown significantly in recent years and we expect this variety to become even more popular in the future. Sulfur sensitive. Selected by Elmer Swenson.